In the earliest form of penjing, first emerging as a developed art form around 600-700 AD in China, people would collect native trees and grow them in small containers as a part of elaborate miniaturized landscapes. Those tiny landscapes were often given as gifts among China’s elite. While Buddhist monks and delegations sent from Japan to China had been bringing back to Japan miniaturized crafted landscapes as souvenirs starting not that long after the art of penjing had been established in China, it wasn’t until the Kamakura period in Japan (1192-1333 AD) that the Japanese seem to have adopted this craft. The catalyst for this widespread adoption was the introduction of Zen Buddhism to Japan. Around the same time in Japan, penjing was distilled down to single, miniature trees, rather than miniature landscapes being the focus, with famed Zen master Kokan Shiren being particularly influential in the spread of Zen Buddhism and defining bonsai as an art form. Besides not strictly being “invented” in Japan, another common misconception about bonsai trees is that they are genetically dwarfed. Instead, they are regular tree and shrub species, traditionally pine, maples, and azaleas, which are manipulated using pruning techniques, including extensive root pruning, to dwarf and shape the plants. While there are many different styles of bonsai, keeping everything balanced is key for whatever type and shape of bonsai tree that is grown, hence Mr. Miyagi’s lessons to Daniel-san about balance in The Karate Kid and using the “baby trees,” as Daniel put it, as a tool for it. For instance, if a leaf or a branch is disproportionately large given the size of the tree, throwing the whole thing out of balance, it should be removed. One should also hide any signs of pruning, so that the resulting tree looks just like it was naturally grown that way and a perfect, to scale, miniature of what the full size version of the tree would look like if it had the same shape. After Japan ended its over two centuries of isolation in the 19th century, the bonsai tree would be popularized outside of the country at fairs and expos around the world, including the Paris Expositions (1878, 1889) and the St. Louis World’s Fair (1904). 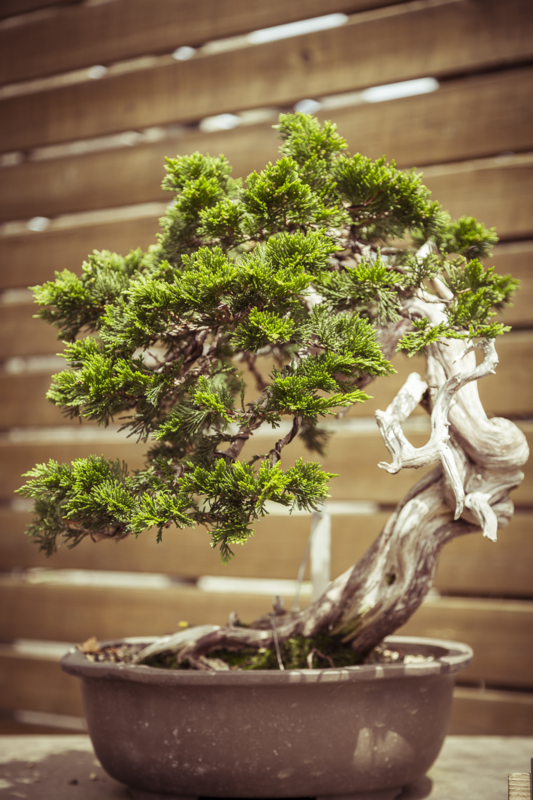 WWII proved both a blessing and a curse to the growth of the bonsai art form. On the major downside, many growers did not continue in this line of work after the war and numerous extremely old bonsai trees were destroyed. Some effort was given to preserving them, however, such as workers at the Tokyo Imperial Palace continually pouring water over and ultimately rescuing some of the remarkable Imperial Collection as the Palace was burning around them after the allied bombing of Tokyo on May 25, 1945. On the positive side, at least in terms of helping to continue the popularization of the bonsai tree outside of Japan, many Allied troops occupying Japan admired the art form and even took classes in it, bringing it back with them to their respective homes. More recently, the art form has been popularized in cinema with, of course, The Karate Kid leading the way. Today, there is a World Bonsai convention that takes place every four years to showcase the best bonsai masters and their work internationally. Washington D.C. also houses the National Bonsai & Penjing Museum dedicated to the miniaturized trees and landscapes. 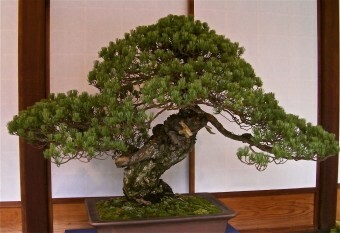 And if you visit the Tokyo Imperial Palace and tour their bonsai collection, you can spy some of the finest specimens in the world, including one of the oldest known bonsai trees, the Third Shogun (pictured right), which is a five-needle pine that has been steadfastly maintained for an astounding five and a half centuries. You’ll often see people confusing “bonsai” and “banzai,” using the words interchangeably, but this isn’t correct as illustrated by Mr. Miyagi, “Miyagi: Banzai! Daniel: To baby trees. Miyagi: Not bonsai, BANZAI!” The former, of course, is more or less the “baby trees,” as Daniel stated. The latter is simply an exclamation not unlike “Hurrah!” or more aptly, “long live!” though literally means “ten thousand years.” Like the art of bonsai, this expression was adopted by the Japanese from China, where it was originally just an expression used to wish long life to the emperor of China. BONSAI….AN ENTIRELY PERVERTED AND SADISTIC ART/ PRACTICE, BESIDES BEING SENSELESS TOO. AN ART/ PRACTICE DESIGNED BY PERVERTS……….. FOR PERVERTS. Care to explain how you came to that conclusion? Oh, and your caps lock key is stuck.